The quality and accurate fit of every part ensures that the components function exactly and harmoniously with the vehicle systems. Parkview BMW is the best source for genuine certified BMW parts. Our knowledgeable parts technicians can advise you on the best part for your vehicle. We offer a full-range of parts, and will deliver anywhere in Canada and the United States. Ask us about our wholesale parts packages. Welcome to Parkview BMW's Lifestyle Boutique: home to a huge selection of parts and accessories for your BMW, and a wide variety of apparel collections that are sure to appeal to the BMW enthusiast within! Call the Lifestyle Boutique at (416) 444-4269 for more information. The end of one journey leads to the beginning of the next. And those who stay home enjoy taking little breaks from their daily routine or are planning their next trip. The main thing is going outside – because this is where life is happening. The BMW Lifestyle Collections are fully geared towards getting you out and about. High-quality clothing for any kind of weather, a comprehensive, highly functional luggage collection and special, clever accessories will entice BMW fans big and small to show their sense of style and experience maximum functionality. Wherever your journey takes you, we hope you will enjoy exploring the world of BMW Lifestyle. On the Lightness of Being. 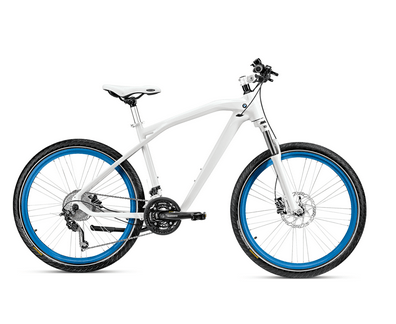 The BMW Cruise Bike’s dynamic potential is reflected in its handling and in its hallmark BMW design. Sophisticated styling and premium components create a riding experience that makes it easy to leave the car behind for a change. 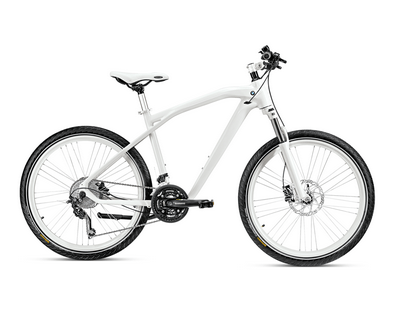 Perfect interplay of dynamism and function: the BMW Cruise Bike. The design of the new bike from BMW uses typical BMW shapes – the striking "bull-neck" and the fine frame design with smoothed welded joints show how well this has succeeded. Due to their large air volume and distinctive profile, the Continental CruiseCONTACT tyres guarantee outstanding cushioning. Thanks to the "safety system", pointed objects and even small shards are not a problem. IMPORTANT: Brakes are manufactured according to EU specifications. For UK, the brake cables must be changed by a specialist (hydraulic brakes). The delivery includes an instruction manual, where you will also find a voucher. Height: 26''. Weight: 15 kg. Aluminium frame, front-sprung. Continental CruiseCONTACT tyres with "safety system". Fork: SR Suntour XCT. Disc brakes Shimano BR-M395 180 mm. Shimano Deore 30 gears. Rim: Rodi, Airline Plus 4 lacing. Saddle: Selle Royal Freccia. Shipping only within Europe. With the BMW Kids’ Collection we have developed products that grow up along with your kids. Take the BMW Cruise Bike Junior: its variable frame geometry makes it suitable for children aged between 6.5 and 9 years of age. While your children grow out of their shoes and clothes at regular intervals, they will be able to enjoy this bike for several years, and that is just as well. After all, there’s an excellent chance that it will become their favourite companion. Just like all our kids’ models, it has a lot going for it. A test-winning sleigh, bikes with cushioned handlebars, and a TÜV-tested bike helmet matching the bike’s frame colour: when it comes to children, safety is our top priority. Translating the dynamism of our cars into the world of two-wheel transport is of special importance to us. Which is why we are all the more proud that the BMW Cruise Bike Junior won the renowned “red dot” award for its innovative and dynamic design. Before designing for kids, you have to observe them. How does a child move? How does it carry? The ergonomically shaped seat of the Snow Pacer and the handlebar of the Kidsbike reflect these considerations. True BMW fans know how to conjure up dozens of perfect memories. The rented Roadster during that holiday in Spain 10 years ago, Eric van de Poele’s dramatic victory at the Salzburgring in 1987, the 3 Series Touring bought after the birth of their second child, or the new 6 Series Coupé whose delivery, to them, cannot come soon enough. There are countless special occasions past and present for the true fan, and every perfect moment can be brought back by means of a detailed miniature. Superior engineering enables the embodiment of dynamic elegance on various small scales and with all the details that convey the perfection of a BMW. Coming up with a realistic-looking miniature requires months of development and state-of-the-art software technology. Our miniatures are handmade and often require more than 100 different process steps. A model is only accepted after it satisfied an painstaking examination by our perfectionist inspectors. the most popular models are almost immediately available as miniatures. We know better than to keep true fans waiting.